Small suggestions for finding Conan merchandise. 1. Try to get to Japan. For most of you, including me now, this is not a viable option, and truthfully, even in Kyoto for 9 months Conan was in a dry spell at that point, so timing counts too. When I miraculously got a trip to Yokohama in 2003, there was a lot more around. 2. Try to get to LA, San Fransisco, or another town with a good selection. Again, not all of us can do this. When I was near LA there were a few stores around, and some had a few Conan posters. 3. Go to a convention. This is much more doable and even the smaller conventions can have good goods. Especially now that Conan has hit America, there should be an upswing in goods available. Again, stores haven't showed any interest in Conan in the past, but it should pick up now. And there's always eBay. Even before Case Closed, they had pencil boards and figurines. Try buying magazines like Animage and Animedia. They often have posters, stickers of all sorts of anime. They also have full page pictures that can be cut out, they make terrific posters. These work for just about any anime that's hot right now, not just Conan. You can find these even in smaller goods stores, conventions, etc. There are a few magazines in English release that work too, but the Japanese ones seem to have better pictures. For example: this. I live in a relatively large city with a small Japanese bookstore and even I don't have access to fresh manga. That's where the internet comes in. I especially have had good results with Kinokuniya. Although their site is in Japanese, they will let you just e-mail them to order books (ask them to call you so you can pay by credit card more securely). The individual tankobon are around $5.50, so if you might have to get only a few at a time. Really, the cheapest place to get them is used bookstores (again, limited to Japan/select American cities). Look for them other places online and at conventions too. Good luck, every one of the 40+ volumes is worth it. Or, if you only want it in English, I suggest writing companies, Viz has good luck with Sunday in particular, to ask them to start a translation. Good Luck! 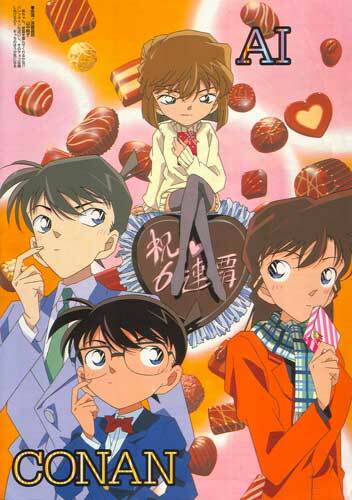 Detective Conan is © Aoyama Goushou, Shogakukan, Touhou and other rightful owners. Site © 2003-2004 H. S. Winston.